by Australian duo Liz Hall-Downs and Kim Downs, known together as Swamp- fish. While driving back home to Washington after attending the ever rewarding California Autoharp Gather- ing (CAG), my friend popped the Australian duo Swampfish disc, Homeward Dove, into the CD player. WOW, I thought, this is music of the spheres, as in, there’s a party in outer space, and we’re invited! The first cut, “Fantasy Life,” an original, is aptly named, and the mournful, almost mysterious vocal harmony on the na-na-na-na refrain (reminiscent of the grade school play- ground taunt ‘neener neener neener,’ but rewritten for a gathering on Mars) remains pleasantly in my brain. The guitar on this cut is particularly nice, and the overall other-worldly feel of the song is intriguing. The rest of the album feels more like the front porch, old-time country, back- yard barbeque kind of music one might expect of, “two weird things that crawled out of the swamp to create hillbilly revelry at every opportunity,” as they describe themselves. The instruments are guitar, banjo, autoharp and percussion, with guests on double bass, accordion and uke. Sometimes described as an “alt- country duo,” Liz and Kim have been singing together for 25 years. Both have come from a history of spoken word/ poetry performing, and their singing and playing reflect both performance experi- ence and longtime musical cooperation, competence and familiarity. Of particular interest is “Going No- where Fast,” with gritty natural vocals and an old-time banjo. It sounds like an old song with rhythm and instrumentation to clog to, picking and singing my blues away; but the sad lyric reflecting on poverty and failure, give it more depth and meaning than a mere toe tapper might normally convey. My favorite lyric is in the song “Thinking Small,” a sweet, but not sappy, message about how the smallest things- hands, feet, birds, ducks-are the sweet- est. This has a nice bluesy country feel, with lots of banjo. Thinking later about the words, they brought to mind an old Tom T Hall song about baby ducks and the pleasure and beauty we find in small things. 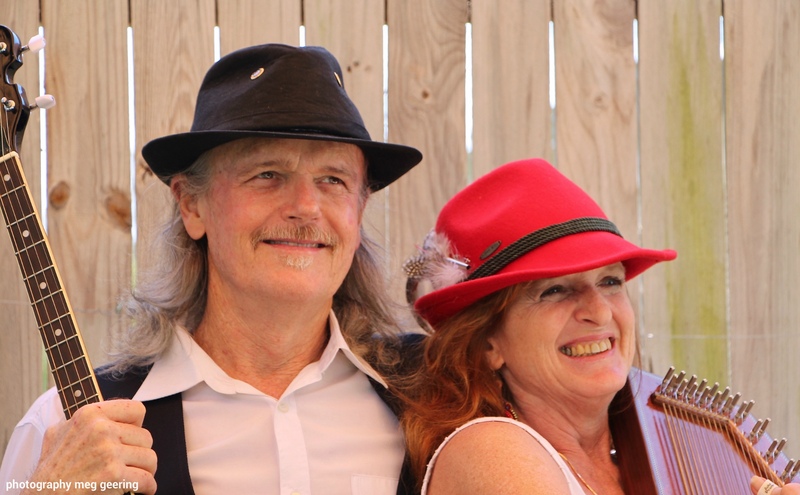 It is a swing tempoed country blues song, with an interesting chord progression and tight vocal harmony that brought back memories of Geoff and Maria Muldaur back in the day. Also of note is “Seduced,” which sounds like old New Orleans street music with come-hither honey vocal and nice um-pah trombone. Most of these extremely varied selec- tions are Kim’s originals, three of which include “Thinking Small,” “Going No- where Fast” and “All on my Own,” were chosen for radio distribution and were played across Australia in 2014 and 2015. Swampfish has been favorably reviewed twice in the Brisbane music publication The Folk Rag. This CD is also available on Spotify and iTunes. longtime affliction, rheumatoid arthritis, put her in need of a friendlier instrument to play. She plays an Orthey chromatic, moving tastefully in and around other instruments and vocals. As usual with group work which includes autoharp in the instrumentation, I’m glad there’s autoharp right in there where it belongs, but I’d like to hear more of it. The autoharp shows up at the edges of lines, and in intervals between other instruments, very appropriate and sensi- tive, no whacking! Among the few offerings not written by Kim, I particularly enjoyed the Randy Newman song, “Guilty,” a low down and swinging blues song, with a wonderful arrangement and fine instrumentation and singing. These two weird creatures from the swamp sure can write and arrange songs, harmonize and provide much musical entertainment and variety. From out in space to the front porch or middle of a street parade. Roots, blues, old-time, Americana-they are good at it all. A fine CD.